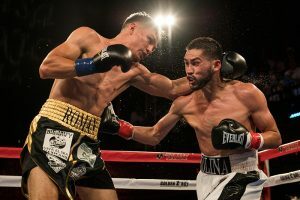 LOS ANGELES – Battling Jessie Roman and ring-rust during a few stages of the fight, Javier Molina was able to grind out a decision win. 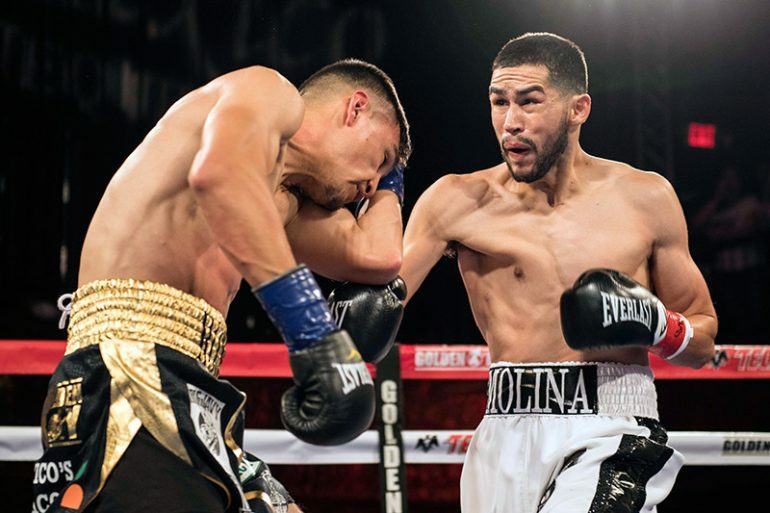 Molina (18-2, 8 knockouts) returned to the ring from an almost two-and-a half-year hiatus to outbox and hold off a late rally, outpointing Roman through eight rounds Friday night. 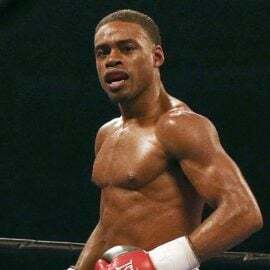 The fight was between two junior welterweights who reside in Southern California and at a crossroads in their career. 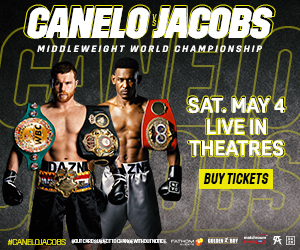 A victory would put them back in contender status and a likely spot on the Golden Boy Promotions’ roster. 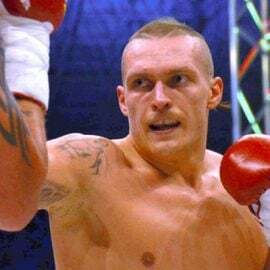 Roman (22-4, 11 KOs) had won his last two bouts after losing a unanimous decision to Eddie Ramirez in July 2016. 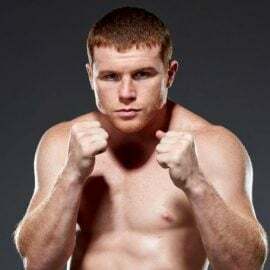 Molina was the more effective boxer throughout the first half of the fight, mixing his attack of combinations to the head and body to the delight of the partisan crowd at the Belasco Theatre. 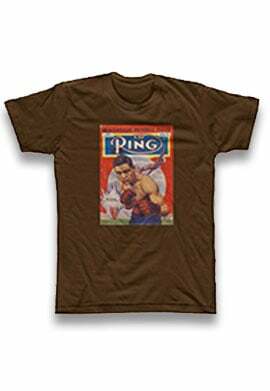 Molina worked from the outside, effectively using his ring generalship to maintain distance and control the rounds. Roman found success landing counter or lead right hands to the head during the middle rounds. 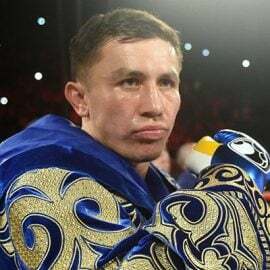 Sensing he was down in the fight, Roman closed the distance between himself and Molina in round seven, connecting with counter left hooks to the head, snapping Molina’s head back on a few occasions. The rally by Roman was too late as Molina accumulated enough rounds early on to by decision. All three judges scored the bout 79-73 in favor of Molina. 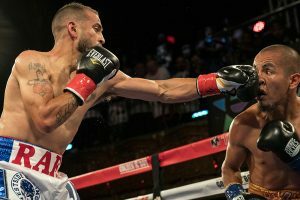 Junior featherweight Rafael Gramajo dropped Victor Ruiz en route to a close eight-round unanimous decision victory. 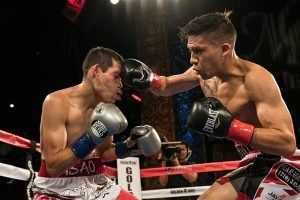 After Gramajo (10-1-2, 2 KOs) won the opening round on aggression, while the southpaw Ruiz kept his distance, connecting from the outside with two-punch combinations. Gramajo closed the distance during the middle rounds, finding success with a series of right hands to the head. Ruiz (22-9, 14 KOs) continued to counter effectively, eventually drawing blood from the nose of Gramajo. Both fighters went for broke during the final two rounds of the fight. During an exchange, Gramajo scored a knockdown towards the end of the seventh round, dropping Ruiz with a counter right hand to the head. The knockdown was the difference in the fight ending in a draw and a Gramajo victory. Scores were 76-75, 76-75, and 78-73 for Gramajo. In the opening round of the ‘Boxeo Estelar’ telecast, bantamweight prospect Joshua Franco stopped veteran Isao Carranza in round five. 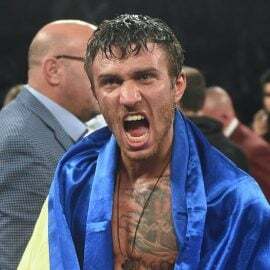 It was Franco’s first fight since his loss to Lucas Fernandez on March 24, a fight Franco was winning before the fight was controversially stopped in round nine after Franco was stunned from a combination by Fernandez. 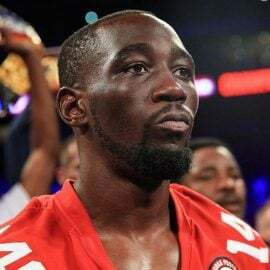 Franco (14-1, KOs) was on the offensive from the opening bell, closing the distance and connecting with several hooks and crosses to the head of the taller Carranza. Franco, who is trained by Robert Garcia, hurt Carranza several times in rounds four and five. A right uppercut by Franco in round five almost dropped Carranza to the canvas. After a combination hurt Carranza, his corner threw in the towel, prompting referee Jack Reiss to stop the bout at 1:36. Middleweight prospect Joel Alday, Jr. won a one-sided four-round decision over Nam Phan (3-7-1, 2 KOs). All three judges scored the bout 40-36 in favor of Alday, who improves to 8-0, 7 KOs.